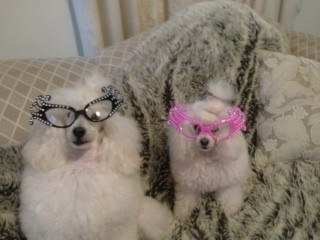 Yes you got it right the fashion princess Chloe has been shopping again. Her fashion photo shoots are going to her head. I have told mum to take the credit card off her. I filmed another TV commercial yesterday – can’t let out any details but will probably be aired by the end of February. Had my photo taken with a very famouse TV personality as well as all the crew. Nailed it within a couple of shots – mum said I am just a very clever little dog. We all had our last training this morning for Pet Expo- and the routines are looking pretty good. Chloe and Campbell are taking out new routines and I will be doing my Mambo routine. We are all going to have a day of rest tomorrow so we are fresh for a very busy weekend!! !